One of the Intercity 125s which is due to become part of the new high-speed fleet went on fire yesterday morning – just as Scotrail was preparing to unveil the new trains with a fanfare. 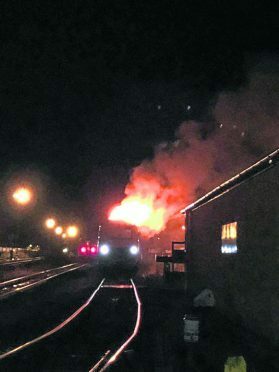 The empty Great Western Railway (GWR) locomotive went up in flames at Exeter in Devon around 5am. Named MullySoft, it is among a 26-strong fleet scheduled to be transferred to ScotRail. The incident made for some awkward moments for ScotRail Alliance’s managing director Alex Hynes as he unveiled a “new era” livery on the first of the fleet at Aberdeen Station. Similar trains are being replaced by Virgin Trains East Coast on routes ScotRail’s fleet will run on, such as Aberdeen and Inverness to London. Virgin is introducing Japanese-designed Azuma trains instead, which use bullet train technology. The fleet’s £50 million upgrading programme is due to continue until all the trains are in service in May 2019. A Scotrail spokesman said that the train wasn’t the responsibility of the firm until it took ownership in July.